What Makes a Cool Youth Ministry Game? Home UncategorizedWhat Makes a Cool Youth Ministry Game? My iPhone buzzed and chimed – incoming text message. A friend sent a couple of videos of a youth group playing some games last night, and I immediately burst out laughing as soon as I started watching the first one. “Jeannie! You’ve gotta see this!” She laughed too. Just for you, I put the two videos together and uploaded the file to YouTube. You can watch it here. Go ahead, it’s only a minute long, so watch it now and then come back here to discover what the video inspired me to write. That video has a lot of what makes for a cool youth ministry game. Here are some off-the-top-of-my-head thoughts about this subject. It’s unusual. How many times have YOU played a relay where you pass a live fish along? Me: never. But now I want to! A great youth group game is one that you haven’t played anywhere else. That’s why I coach youth leaders to get unusual with the games they play. If you’re playing Kickball, play it in such a way that is unique to your group – like have only one base, there are no force outs, and you can have as many players on the base as can touch it. BUT, if they’re making a mad dash for home and just ONE of them gets hit by the ball, they’re ALL out! It has “Brag Factor.” When your young friends are saying to their friends the next morning, “Dude, you shoulda been there! 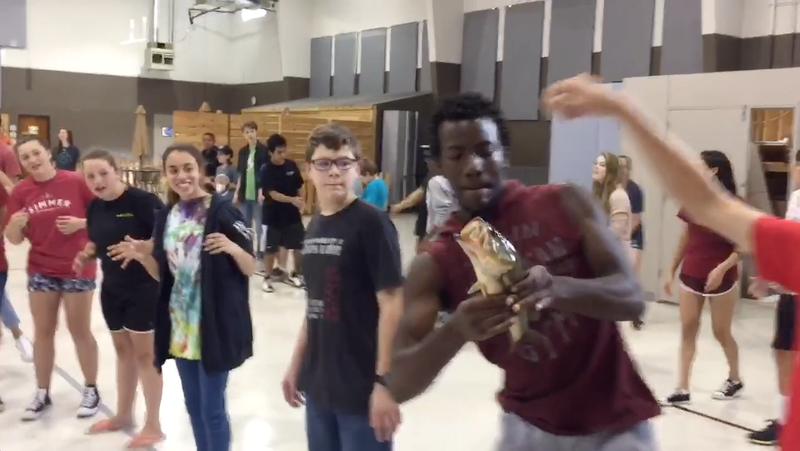 You won’t believe what we did!” – that activity has “Brag Factor.” You can bet that plenty of kids were bragging to their friends this morning about the fish relays! It’s easy to set up. The best games are those that require minimal explanation. Form a single line as a team. Pass the fish down the line. The last person kisses the fish and passes it back. First team to get the fish back to the front, wins. Easy peasy! Complicated games CAN be fun, but sometimes the setup takes so long the kids lose enthusiasm before the game can start. Anyone can play. The studly guys are just as good as the tiniest girls. Coordinated kids aren’t any better at this game than uncoordinated ones. That means everyone can play – and you don’t wind up with some non-energetic kids sitting against the wall and watching. Guys love it. When I’m planning the youth ministry activities, I have one person in mind: a 16-year-old guy who’s not sure he wants to be there. If we can reach that guy, get him engaged and having fun, then we can reach ALL the kids. So, have a GREAT time with teenagers – can you imagine trying to play these relay races with a bunch of baby boomers?! One of youth ministry "old guys" (he prefers "guru"), Emperor of JumpStart Ministries, guitarist, and pilot. Ken's been married to Jeannie since they were Juniors in college, and has nine (count 'em) NINE grandkids. © 2019 · JumpStart Ministries Theme by HB-Themes.